Title: Landscape ecology and behavioral responses of the Sunda pangolin (Manis javanica) to habitat fragmentation and degradation in Sabah, Malaysia. Sponsor: Houston Zoo Inc., USA. In Sabah, the Sunda pangolin (also known as a scaly anteater) is reported as relatively widely distributed (Payne & Francis, 1985). However until now there are no detailed studies on population levels, ecology, or life history, which are crucial for the conservation and protection of the species. 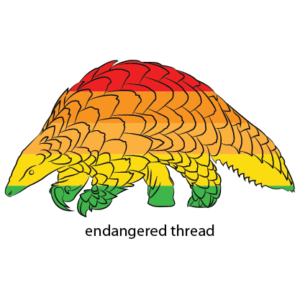 The Sunda Pangolin has been long facing serious threats from habitat destruction, due to habitat conversion and degradation in Borneo (Sodhi et al., 2004). Illegal hunting and wildlife trade are closely related to habitat destruction, for example logging roads provide better access to forested areas (Sodhi et al., 2004; WWF, 2005). In addition, this species is threatened with extinction due to high levels of hunting and poaching for illicit international trade mainly for its meat and scales (Challender et al., 2014). To determine the movements of Sunda pangolin in a fragmented and degraded landscape in Sabah. Sign spotting: for an elusive and nocturnal animal such as the pangolin, it is almost impossible to find individuals but signs of their presence can be observed. The technique is conducted during the day to find indirect signs of pangolins like opened termite nests, bark scratches, underground burrows, footprints, feces or scales. The sign spotting will be carried out along trails, noting any signs of pangolin evidence. Spotlighting: used for nocturnal animals to try and locate them during periods of activity. It is conducted by spotting eye shine by torch lights. Other direct signs like rustling noises and smells are also observed. This technique is conducted during the night from 2200-0300 hours. Transect for spotlighting defined by time between four to six hours each time at a very slow pace around 500 m/hour performed by two to three persons. Camera trapping: To establish the presence/absence and activity patterns, camera traps with an infrared triggering system technology (RECONYX brand) will be set up. All cameras will be operated 24 hours a day. The camera takes a picture whenever a moving source of heat is detected within the scanned area. Functionality of camera traps will be checked every month. All setup points will be recorded by GPS. The canopy coverage will be captured using a digital camera and calculated. Satellite telemetry: a small tagging device unit will be attached to a scale of a hind leg of a pangolin instead of using a radio-collar because of the nature of the pangolin (Lim and Ng, 2008). The pangolin usually rolls into a ball when sleeping/resting and is a burrowing animal; hence radio-collar is not be suitable. Once captured, the pangolin will be sedated to collect blood, hair and scale samples. The satellite-tagged pangolin will be measured, weighed, photographed, and their health will be checked. The animal will be released back to its capture site and closely observed for any adverse effect. After release, tracking will be conducted to collect behavioral observations. Satellite data will provide information on activity patterns, habitat use, home ranging, and dispersal distance. Community survey: interviews will be conducted with respondents from the local communities who might be possible hunters, traders and consumers. The interviews will be conducted as formal conversations by using a structured questionnaire adapted from pangolin surveys carried out by TRAFFIC (Chin & Pantel, 2009). These interviews will provide insights on pangolin ecology, trapping techniques, and hunting activities in Sabah. Upon completion of the study, the findings will be written up for scientific publications and reports that would be applied to the conservation of the Sunda pangolin in Asia, particularly in Sabah. The results of the study will help to understand the needs of the Sunda pangolin in Sabah and working towards long term conservation actions for the species. The research will also serve as an education tool to increase awareness among local communities (including potential hunters, traders and consumers), and plantation managers and workers, on the status of endangered wildlife and legal consequences of possession and/or consumption of the species. The results of this research will be included in a Sunda Pangolin State Action Plan.